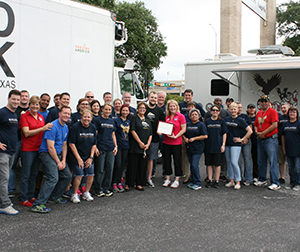 On May 23, 2016 Soldiers' Angels held another hugely successful Veteran Mobile Food Pantry at our headquarters in San Antonio, Texas. The major underwriter for this month's event was Chenega Corporation EH&F. With the help of a fantastic group of volunteers from Chenega Corporation and USAA, we served 144 local veteran families with food baskets! Thank you to everyone involved in helping Soldiers' Angels keep this monthly event going. Be sure to check out the Events Calendar for information on the next Mobile Food Pantry in San Antonio as well as the introduction of our Veteran Mobile Food Pantry in other cities across the U.S.